Robert Earnshaw has joined Cardiff City on a two-year contract after turning down a new contract offer to stay with Nottingham Forest. Striker Earnshaw, 30, arrives on a free transfer and becomes the fourth signing of new Bluebirds manager Malky Mackay. Since leaving the Bluebirds in 2004, Earnshaw has also played for West Bromwich Albion, Norwich and Derby. But the Zambia-born Wales international has remained a cult figure among Cardiff fans. 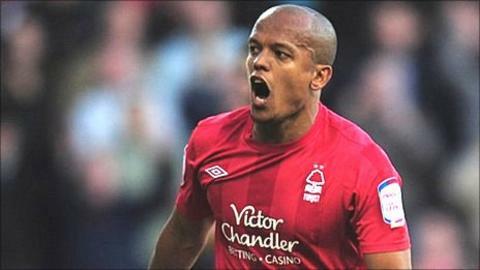 In three seasons at Forest, Earnshaw scored 45 goals and new manager Steve McClaren was hoping to persuade him to accept a new contract. Celtic, West Ham United, Blackpool and Birmingham had also shown an interest in the proven goalscorer. But the temptation to return the club where he made his name has been too strong for the striker to ignore. He scored 105 goals for his home-town club in 205 games after emerging from its junior ranks in 1998. His most prolific season came in the 2002-03 season when he broke the club's scoring record by netting 35 goals in all competitions, 31 of which came in the league. Earnshaw, who has cost £12,650,000 in transfer fees over the course of his 13-year career, has also scored 16 goals for Wales in 54 appearances. His return to the Welsh capital sees him join a club that has undergone significant changes since his departure. The Bluebirds have moved from Ninian Park to Cardiff City Stadium and have a new training facility in the Vale of Glamorgan. They have also been failed challengers for promotion to the Premier League in the past three seasons. That failure cost Dave Jones his job at the end of the 2010-11 season, with former Watford boss Mackay appointed to take over. Earnshaw has already publicly backed Mackay to succeed and now has the chance to follow Welsh rivals Swansea City into the top flight. The striker's arrival will also soften the blow of losing Craig Bellamy, Michael Chopra, Jay Bothroyd and Chris Burke since the season's end. Mackay has already signed Andrew Taylor, Don Cowie and Craig Conway since joining the club.